The Campus Life Pavilion, located on Peavine Creek Drive at the former site of the Black Student Alliance House, incorporates elements from the previous structure and will feature a plaque honoring African American students who integrated the university. The stars are incorporated into a beam over the main entrance to the new Campus Life Pavilion. The words are inscribed for posterity on a cast-aluminum plaque mounted on a granite wall at the base of the new facility, which will be formally dedicated on Friday, Oct. 20, during Homecoming. 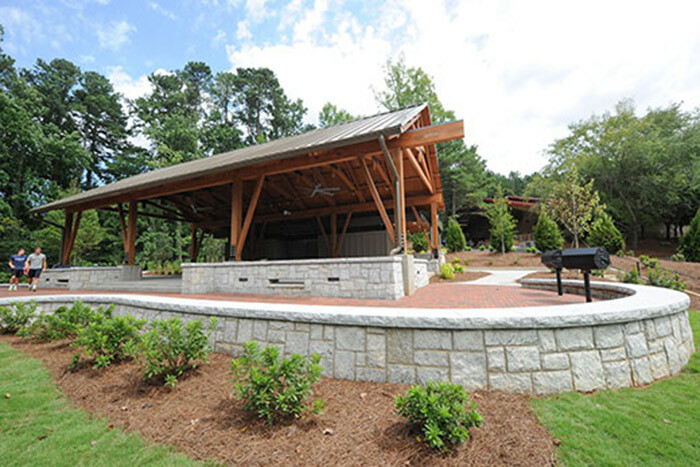 The outdoor student pavilion, located across from Chappell Park baseball field at 716 Peavine Creek Drive, provides an informal social space to accommodate flexible programming for students and other campus groups. 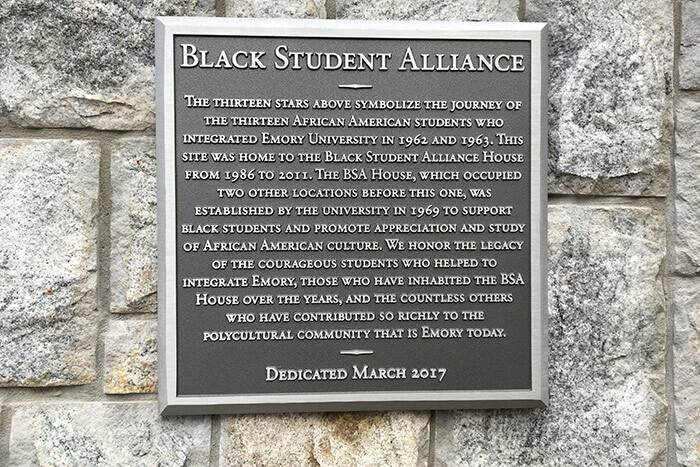 The message on the plaque also explains that the Black Student Alliance (BSA) House was located on the same site from 1986 to 2011. Established in 1969 by Emory, the house occupied several campus locations over the years. According to a second plaque, inset in the walkway of the main entrance: “The steel beam above and many wooden elements of the ceiling” were structural components of the BSA House, “incorporated to help carry forward the spirit” of that earlier structure. The dedication ceremony, set for 7-9 p.m. Friday evening, will feature remarks by President Claire E. Sterk and Dean of Campus Life Ajay Nair, a presentation by Emory students and a performance by the vocal group Voices. Food and drinks will be served. Students, staff, faculty and their non-alumni guests should register for the Pavilion Dedication here. Alumni should register for Homecoming 2017 here.